Whether you manage a customer service team, a sales team or your organization’s human resources department, social media has become a valuable and often essential part of your day-to-day operations. To capitalise on its true business potential, your team needs to be well versed in the fundamentals of social media. As each of the biggest social networks is a unique tool with an equally unique audience, the basis of social media education should introduce each of these networks and how to use them. 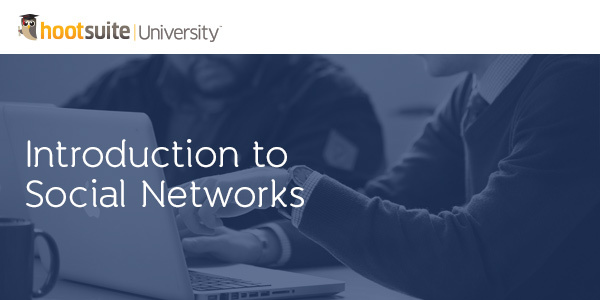 With that in mind, HootSuite University has released brand new courseware covering an Introduction to Social Networks. This 9-part video course will teach your team how to get the most value from social media with a simple, easy-to-follow introduction to today’s top social networks. Training an employee on the fundamentals of social media for business can be a lengthy process. But training an entire team? That really requires a structured educational program that will allow you rapidly and effectively scale up your team’s social media efforts. HootSuite University also allows you to track the progress of individual employees as well as your entire team. The structured courseware includes tactical training, workbooks and a self-assessment exam that will help your team become more streamlined and successful on social media. Learn more about HootSuite University’s education and training available to HootSuite Enterprise clients.